After multiple years of planning and well over a year of construction, the public is invited to the grand opening of The Haven project in NYA on Sunday. The Haven, a $6.9 million project, will be an addition in senior housing and will be connected to both Peace Villa, which was built in 1978 and has 61 apartments that currently house 110 seniors, and The Harbor, which was constructed in 2006. The aim is to enhance the community. The project was funded with USDA Rural Development Loans acquired through the city, which will be paid back with proceeds from The Haven. 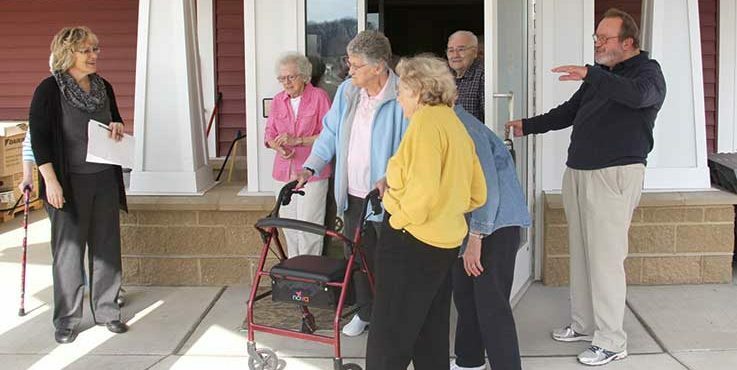 Last Thursday, residents of Peace Village and a few select community members had the first chance to tour the project that will have 37 units, with 25 units of assisted living and 12 units of memory care. After walking the long connected hallway with benches for rests, residents were able to take in the new sights of the first and second floors of the building throughout the tour. In addition to commenting on the spacious rooms and walk-in closets, they also were quick to notice activity rooms, kitchens and sitting and sun rooms adorned with unique touches of design ranging from fabric, furniture and lighting selections. Both Peace Villa housing manager Brenda Schmitz and Harbor manager Lori Hilgers were quick to highlight the efforts of Sari Anne Olson of Rajala Designs and site manager Shawn Robinson. Of particular note were the stained glass windows made by Dee Thomas of Henderson. “It’s fun for us to see it all come together,” said Schmitz. Two residents will be moved in right after the open house, and the plan is to have two people move in per week with an ongoing wait list for the units still available, according to Schmitz. The assisted living units will be the first to open and the memory care is expected to open in middle of June. The grand opening of The Haven will be on Sunday, April 24, with a program at 1 p.m. and tours, entertainment and refreshments from 1:30 to 3:30 p.m.